The configuration “Management of a trade enterprise for Ukraine” is a comprehensive solution for automating management and accounting tasks at enterprises engaged in any type of commercial activity. The configuration allows you to automate the tasks of operational, managerial, accounting and tax accounting, personnel accounting and payroll, analysis and planning of trade operations, the preparation of mandatory (regulated) reporting, thereby ensuring the effective management of a modern trading enterprise. He controls and plans mutual settlements with suppliers, controls the fulfillment of contractual obligations by delivery time, by the quantity of delivered, under contracts, goods or materials. Controls the actual movements in the warehouse. Analyzes discrepancies and identifies those responsible for each discrepancy. Keeps a clear record of all fixed assets on the balance sheet of an enterprise and performs operations with fixed assets regulated by law: accounting for new assets, commissioning, wear, indexation for operation, transfer to repair, reception from repair, fixation of completed repairs or upgrading of operating systems, fixing the transfer and sale of the OS, etc. Each event relating to the OS is reflected in the appropriate print form approved by Ukrainian legislation. OS Cards are generated automatically. If the company uses additional types of charges, the calculator independently creates formulas for their calculation, which creates independence from any programmers. The employee independently manages the methods of payroll calculation that are accepted at the enterprise. Simple entry of correction documents that helps reverse invalid entries. For example, the calculator made a mistake when calculating wages and in the next period found this miscalculation. He easily corrects the error by entering a correction document. As a result, the system automatically cancels incorrect entries with correct notes about error periods and its correction. It is important that the requirements of the legislation will be met at the same time without spending a lot of time on the part of the calculator. Automatic generation and completion of a full set of standard-regulated statements – balance sheet, statement of financial results, declaration of profit, single tax reports, calculations of excise duty and others. Thanks to the “Zvit” system, you can not only generate these reports, but also sign them with an electronic signature and send them electronically to the necessary authorities. Convenient forms of standard reports to control account entries, such as a balance sheet, account card, etc. Responsible for tax accounting analyzes the deviation of the amounts of tax and accounting. 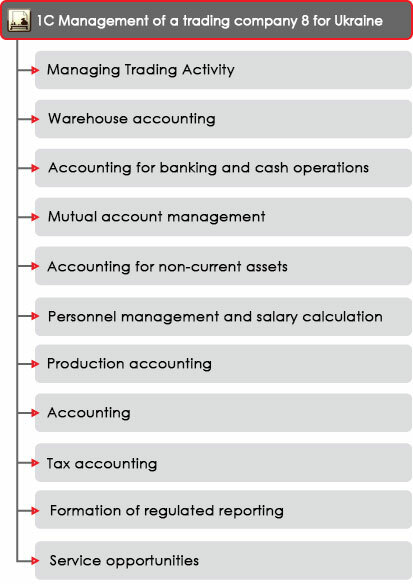 Due to the fact that in standard reports (account analysis, turnover balance in an account, and others), the amount for a specific accounting cost is immediately visible, the amount for the same cost is also evident in tax accounting. Thus, it becomes extremely easy to control discrepancies. A tool for monitoring and analyzing cash that employees need. The head can approve, reject or postpone any of the payments and analyze the current situation of the payment calendar – whether the company has enough money or a cash gap is planned. Thus, it is possible to optimally use the funds of the enterprise. The card is generated automatically, based on the input of primary documents, such as personnel documents, movements, absenteeism, sick leave, etc.